In 1983, Stephen King’s horror novel, “Pet Sematary,” was published. Six years later, a film adaptation was released that was sunk by a bland lead performance and a severe lack of frights. Now, King’s book is given a second chance to scare audiences with the help of directors Kevin Kölsch and Dennis Widmyer, and with committed performances and a superior grasp on the story’s creepiness, we have an adaptation that lives up to King’s spine-chilling book. Louis Creed (Jason Clarke) moves from Boston to Maine with his wife, Rachel (Amy Seimetz), their daughter, Ellie (Jeté Laurence), and their son, Gage (Hugo Lavoie and Lucas Lavoie). 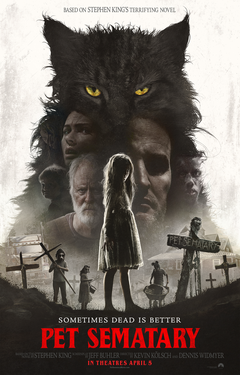 Not long after being in their new home, they discover a mysterious pet cemetery in the woods nearby that holds dark secrets, and they soon become victims of its power. Clarke and Seimetz offer well-matched performances that show their characters’ conflicted views on issues that they face in the story, such as how to approach the subject of death. They provide strong, emotional reactions to the life-altering events that they experience, exhibiting the terror and grief that they feel during what was supposed to be a fresh start for their family. Thanks to their compelling bond on screen, Clarke and Seimetz succeed in making us feel the agony of having their idyllic lives take a shattering turn into something unspeakable. John Lithgow has a welcome supporting role as Jud Crandall, a friendly neighbor of the Creeds who knows more about the pet cemetery than he lets on. Fred Gwynne portrayed the character in the 1989 film and was the best part about it. Gwynne made a strong impression in the role, and it all worked because he had to make up for the staleness that permeated the rest of the movie. In the case of the remake, Lithgow goes for a more restrained approach, which is fine because he’s sharing the movie with other talented actors and actresses, so there isn’t any need for him to go as far with the backcountry, salt-of-the-earth mannerisms that were achieved by Gwynne. While King’s novel is so detailed in constructing his characters and the nightmarish situations in which they find themselves, the screenplay by Jeff Buhler still does a fine job in capturing the essentials of the source material. With a running time of a little over an hour and a half, the movie manages to hit many of the important events that are found in the book. However, the movie can feel a bit rushed at times, given that, in the novel, King provides Louis with enough time to sort through the logistics of his significant decisions, which makes us feel the weight of those choices as Louis tries to figure out if the actions that he’s about to take are right or wrong. Aside from that, Buhler includes a few big changes to the movie that work in its favor. If you’ve read the book and/or seen the 1989 film, you’re in for a couple of surprises as the narrative goes in an unsettling new direction, adding some shocks to a story that you think you know. Laurie Rose’s cinematography captures the beautiful greenery of the woods near the Creed’s home in the daytime sequences, while displaying the mistiness and deep shadows of those woods in the nighttime sequences. These scenes provide you with the eerie feeling that King delivers in his novel, and they absorb you into the dark history of this terrain. Although there are some unnecessary jump scares, Kölsch and Widmyer don’t overload the movie with too many of them and instead focus more on the sense of dread and disquieting atmospherics. They exhibit the picture-perfectness that the Creeds feel as they arrive at their new home, and then succeed in bringing us into the terror that begins to tear away at the characters’ lives. Between the acting, writing, and directing, all of which deliver a fine translation of King’s novel from the page to the screen, Kölsch and Widmyer bring life to this cemetery.